This latest blog comes from Simon Pirani, who recently gave a seminar at the College on the quest for a fossil-fuel free future. You can also download a copy of his slides as a PDF. How did we get into this mess? The world economy wolfs down fossil fuels at more than four times the rate it did in the mid-twentieth century. 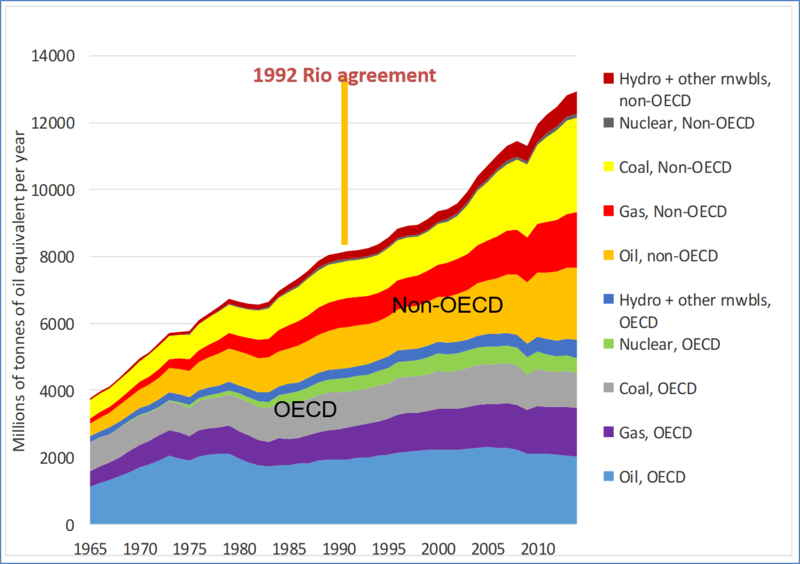 Since the world’s governments gathered at the Rio conference in 1992, and acknowledged the need to cut fossil fuel use, it has risen by more than 60 per cent. To make the transition away from fossil fuels, an understanding of the historical drivers of this consumption growth is vital. The broader context is the Anthropocene epoch that earth systems scientists have concluded we live in, in which human activity impacts the natural world at as great a scale as big natural forces. There has been a “great acceleration” of these impacts since the mid twentieth century; fossil fuel use and the greenhouse gas emissions it causes is central to this. But fossil fuels are not consumed by an undifferentiated humanity. They are consumed by people living in specific social and economic relations with each other: predominantly, in the late 20th century capitalist economy. That economy’s expansion is the framework within which fuel consumption has grown. The technological systems that are the largest fuel consumers – electricity systems, urban transport systems and built environments, military systems, and so on – are controlled by small groups of people, in the context of broader relations of wealth and power. Moreover, most fossil fuels are consumed in the labour process broadly defined, i.e. in the production of agricultural and industrial goods and services, construction, and so on. A relatively small portion of fossil fuel use is attributable to individuals at household level, overwhelmingly in the rich world. In researching fossil fuel consumption history for a recent book, I took changes in the big technological systems, and the way they are embedded in social and economic systems, as the starting point. Fuel consumption growth is correlated with economic growth, but not with population growth. “Economic and population growth continue to be the most important drivers of increases in CO2 emissions”, the Summary for Policymakers of the IPCC’s Fifth Assessment Report (2014) states. This oversimplified assertion needs to be questioned. There is a clear correlation between measures of economic growth (e.g. aggregate Gross Domestic Product) and fuel consumption levels, but no such correlation between population growth and consumption growth. Take the two largest fossil fuel consumers of the past forty years. In China, population growth has been steady, while the sharp acceleration of fossil fuel consumption growth in the 2000s was obviously related to the industrial boom. In the USA, fossil fuel consumption growth has zig-zagged. It has gone into reverse three times, twice because of oil price shocks in the 1970s, and once because of the economic crisis of 2008-09. Another significant example is Russia, where for the last forty years population has been falling, but fossil fuel consumption has risen. There was a sharp drop in fuel consumption in the 1990s; again, that correlated with an economic slump. Because people consume fossil fuels in a mediated way, through technological, social and economic systems, the relationship between population growth and consumption growth is indirect; it is mediated through those systems. The technological systems that consume most fossil fuels have developed in certain ways, and not others, because of social, economic and political contexts. For example, energy-intensive car-based urban transport systems, a major contributor of greenhouse gas emissions, first developed in the USA in the interwar period. The technological precondition for this development was the invention of the internal combustion engine and its superiority over early electric engines. But social, economic and political factors were surely decisive: concentration of car manufacture in politically-powerful corporations; their pioneering of mass production, and of marketing techniques e.g. planned obsolescence; the political drive, supported by these corporations, to fund road infrastructure and to undermine alternative forms of transport (rail, public transit, etc). This car-based transport system was established in the USA before the second world war. After the war its expanded further, going together with the construction of spread-out cities with suburban housing. The US pattern was followed, albeit not uniformly, in Europe and other rich countries. In the 1970s, the extreme fuel-inefficiency of car manufacture was clearly recognised; from then onwards the car industry became a good example of the failure of regulation to constrain energy-inefficient practices. From the 1980s, especially, car-based transport systems were diffused across the global south. This diffusion was supported by international development institutions – long after the pitfalls of car-based systems, from both urban planning standpoints and global warming concerns, were well understood. The interaction of technological, social and economic factors may also be traced with respect to other major fossil-fuel using technologies such as steam turbines, electricity networks and energy-intensive manufacture, and so on – mostly, products of the “second industrial revolution” at the end of the 19th century. But the “third industrial revolution”, i.e. the onset of computerisation from the 1980s, not only did not reverse energy intensity trends, but sometimes paved the way to new energy-intensive phenomena in the economy. Witness electricity consumption by data farms that support the internet, which is estimated to make digital technologies’ total electricity usage greater than India’s. The history of fuel-consuming technologies is also the history of “roads not taken”. The lack of progress by energy conservation technologies, and non-fossil methods of producing energy, are the other side of the coin to dominant energy-intensive and energy-inefficient technologies. Why so little progress since the 1970s? The pioneering energy researcher Amory Lovins pointed to these “roads not taken”. He blamed “poor information, […] ideological antipathy and rigidity” and “institutional barriers”; all these could be overcome by “properly using the markets we have”. History has borne out many of Lovins’s arguments, but not this view of society and the economy. Once the recessions of the 1970s and early 1980s gave way to a new surge of global economic expansion, ever-greater sums of capital were invested in existing, energy-intensive technologies and their geographical expansion. The hopes of Lovins and many others that regulation might be used to support “rational” use of energy were crushed under the wheels of neoliberalism. Research of technological systems on one hand, and social systems on the other, needs to be more closely integrated. Energy flow analysis long ago established that energy supply systems must be viewed as a whole (using the categories of primary energy, secondary energy, useful energy and energy services). Sociological research has tried to characterise how demand is formed, i.e. to what extent it is determined socially, what role is played by consumerism and advertising, and so on. Since the 1980s, researchers have worked to synthesise technological and social analyses. But no consensus has yet been formed. An example of this disconnect concerns the distinction between discretionary and non-discretionary consumption by individual households – that is, between energy that householders use by choice, and that over which they have no choice, because it is used by a technological or economic system over which they have no control. This distinction was already being highlighted by researchers in the 1980s. In the 2000s, David Goldblatt and others proposed ways of developing the concept. But there was no such development. This is a gap between academic disciplines that has yet to be bridged. The study of inequalities in energy supply needs to go beyond national consumption-per-head statistics. These statistics feature prominently in the international climate negotiations, as a result of the developing countries’ efforts to get rich countries to pay for the damage they have done. But they can not possibly reflect much that is essential, because they can not show the working of the systems through which fuels are consumed. Researchers have recently attempted, using top-down methods that build on consumption-per-head statistics, to gauge the extent of inequalities between individual consumers within nations. There have been recent papers by Shoibal Chakravarty et al, and by Lucien Chancel and Thomas Piketty, on individual “high emitters”, linked to a proposal for a “universal emissions cap”. Such approaches can not reflect the role of technological systems, though. They have been questioned by researchers of energy flows, whose arguments deserve consideration. Inequalities, like energy consumption in general, can be understood through their historical development. Urbanisation, from the 19th century in the richest countries, divided people from their natural surroundings and natural energy sources. To a large extent, the history of coal, and then the history of electricity, is initially a history of energy being supplied – in far greater quantities than ever before – to industry and to urban populations. Under capitalism, this separation from natural fuel sources during urbanisation was followed by commodification: the production and exchange of fuels and electricity as commodities, and the evolution of fuel supply as a profit-driven business. Energy supply also reflected other fundamental aspects of capitalism, such as the extractivist grabbing of energy carriers, principally oil, from countries in the global south. Once this commercial energy system was established, an alternative economic model of energy supply appeared within it: the provision of electricity, and sometimes of fuels, as a state benefit. In the early twentieth century, electricity, and sometimes heat or fuel, was provided to industry as a state subsidy, and/or to urban populations as a municipal service. For rich-world governments, electricity provision was seen as a necessary support for industrial development. For the labour movement and other advocates of a welfare state, it was increasingly seen as a right for urban workers. However, even in rich countries, until the mid 20th century, many people, including much of the countryside, remained all together outside the commercial energy system. Energy supplied through the commercial energy system as commodities. Energy supplied through the commercial energy system, but provided by the state as a free or heavily-subsidised benefit. Energy supplied outside the commercial energy system, generally outside towns and beyond the reach of electricity networks. The division between commercial and non-commercial energy systems is fuzzy. IEA statistics show that there are about 1 billion people with no electricity: they may generally be considered to be outside the commercial energy system. A larger group of between 1.5 billion and 2 billion – many of them the urban poor in developing countries – have at least partial electricity access, but use biofuels to cook. They are midway between commercial and non-commercial systems. It is the historical development of the commercial system that has shaped the fundamental inequalities in energy consumption. The way that political decisions, and specifically the history of the international climate negotiations and their failure to reverse fossil fuel consumption growth, relate to these systemic factors. This will help inform a view of the transition away from fossil fuels that starts from the need to change all these systems – technological, social and economic. Simon Pirani is author of Burning Up: A Global History of Fossil Fuel Consumption (Pluto, August 2018). He is Senior Visiting Research Fellow at the Oxford Institute for Energy Studies, where he has worked on the natural gas research programme since 2007, writing on the natural gas sector in Russia, Ukraine and the Caspian. His other publications as a historian include The Russian Revolution in Retreat: Soviet workers and the new communist elite 1920-24 (Routledge, 2008) and Change in Putin’s Russia: Power, Money and People (Pluto, 2010).